There is a difference between a rapper and being a artist. There is a huge debate-but for the purpose of this review-we will keep it short and simple. One can define a rapper as someone who rhymes (r.a.p.-rayhmes as poetry) on a broad scale of looking at the culture. However, a artist is completely different. A artist sticks very close to it’s root and does that…create art. In the hip hop culture, we see less artists and more rappers. Within this review-I’ve found a hip hop artist that paints pictures with his lyrics…Red Baron. Red Baron brings us “Shades Of Grace” as an illustration of hip hop at its purest form. Red Baron uses elements of jazz, blues, soul, rock and gospel as colors on this 21 track hip hop canvas. Let’s take a look at it. HAVE PLENTY(FEATURING TOMEKA CARROLL)-LYRICS-4 PRODUCTION-3 FAVORITE BAR-“IT SEEMS THE LIFE WE WANT MOST IS THE ONE WE DON’T LIVE/WE THROW FITS AND JONESING TO KEEP UP WITH THE JONSES” Red Baron starts the album of with a powerful stroke of his paint brush with “Have Plenty” dealing with a deadly addiction that more people accept than any other addiction…materalism. He talks about the “Jonses” syndrome and the endless cycle of always wanting, but realizing if you have God-you have plenty. Tomeka does a great job on the chorus and the production puts you in the mind of Sade’s “No ordinary love”. Good song. THE (REAL) GOOD LIFE(FEATURING LADY BARONESS, NAKEESHA BENSON, KARENA SHEPPARD)-LYRICS-3 PRODUCTION-4 FAVORITE BAR-“IT’S KINDA LIKE BRAILLE, YOU CAN NOT SEE IT, BUT YOU CAN FEEL IT” This track has a real good “go go” feel. It catches you right off the start. I see this track being a good single or really good on radio. The guest vocals make the song shine. The message is good and it’s a good solid song. MR. INVINCIBLE-LYRICS-4 PRODUCTION-3 FAVORITE BAR-“DO YOU REALLY LOVE IT OR ARE YOU GOING THROUGH THE MOTIONS( A GREAT DOUBLE ENTENDRE! )” This is a great story/testiomy of Red Baron as a lawyer turned hip hop artist. With the production and his flow, he gives a WU tang vibe mixed with a little MF DOOM on this track. The production feels so much like early wu and his cadence is very tight on this track. He also makes valid points of how lawyers aren’t all bad and people should actually respect them. He talks about his hardships and triumphs and does a great job painting that picture in this track. GOOD FAITH-LYRICS-5 PRODUCTION-3 FAVORITE BAR-“AMIR WANTED TO TASTE DEATH ALL OF A SUDDEN EAT AND FEAST ON THE FOOD OF DESTRUCTION” This is my one of my favorite Red Baron song. He grabbed some black paint brushes and painted a dark reality of “faith”. I always say be careful of using the pharse “keeping it real”, because what is real to you MAY not be real to someone else. This point is proved within this song. Classic verses and defintly a REPEAT OFFENDER! A BLACK AND WHITE AFFAIR-LYRICS-5 PRODUCTION-4 FAVORITE BAR(2 WAY TIE)-“YOUR NOT WHITE, WHY ARE YOU USING PIECES OF PEACH?” “I WAS GETTING MORE As THEN A PACK OF DURACELS” This also is one of my favorite Red Baron tracks. Once again, Red Baron gives you a jaw dropping piece of art on “a black and white affair”. He speaks on racism and streotypes on both sides of the specturm. I can personally relate to this song-so it speaks to my soul. This song would make a great video and is a universal song that people of all races would appericate. Powerful song. IF HIP HOP IS DEAD-LYRICS-LYRICS-5 PRODUCTION-5 FAVORITE BAR-“IF HIP HOP IS DEAD, IT’S BECAUSE YOU KILLED IT” All I have to say is…WOW! I feel as though Red Baron is in his lane on this track and when the beat breaks down…classic sound and classic flow. He took it back to the essence and sounded like hip hop it’s prime. THIS MUSIC-LYRICS-4 PRODUCTION-3 FAVORITE BAR-“AND THAT’S HOW YOU HEARD TIS MUSIC THIS EVENING” “This music” brings Red Baron full circle with his story being a hip hop artist. On this track he gives his past, present and future concerning his “art”. His delivery has you hanging on to his every word till the end. Overall, I give this album a 4. This is a really good album and for 21 tracks on it-it kept my attention. The lyrics are great and there is a so much depth that Red baron gives us. The interludes are great and allows the concept of the album to flow well. I appericate the production, but some beats were missing certain elements to make them sound full. I’ve seen Red baron do his show live and can see that he is a excellent live performer and these beats actually work for his live performance. This album is a good listen for more conscience listerners and deals more on the serious side, even though Red Baron can be playful at times. This album will make you a fan and want to learn more about what makes him tick. Make sure you check out “Good faith” “A black and white affair” and “If hip hop is dead”. These are Red Baron’s best creations on the album. If you want to keep up with Red Baron, check him out on twitter at @thetrueredbaron and also at his website www.paintedred.net . 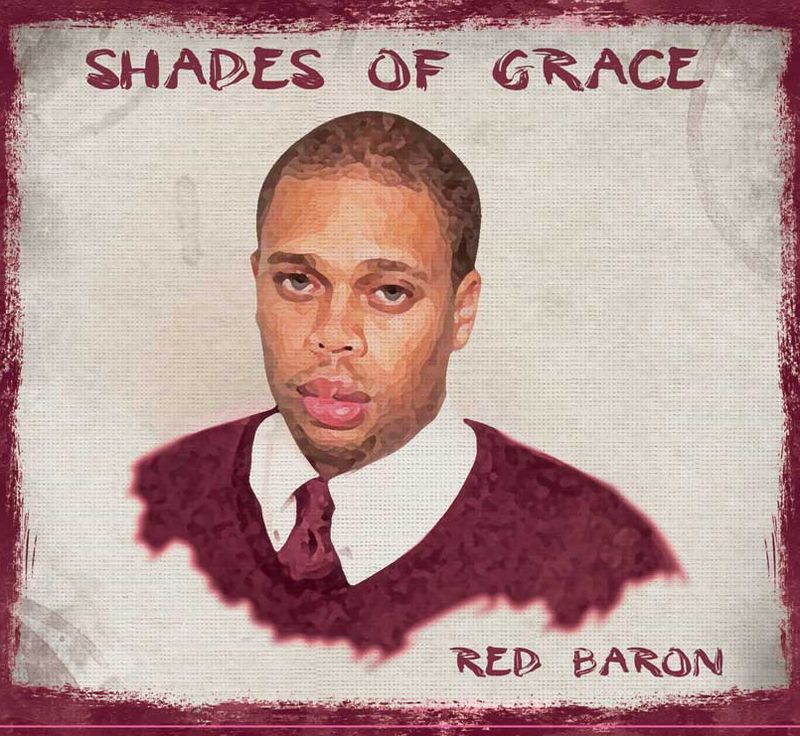 At the end of the day “Shades Of Grace” is a album from Red Baron that is…picture perfect. Spread The Soup. This entry was posted in Album reviews and tagged cd review, chican's choice, chicangeorge, hip hop, red baron, shades of grace. Bookmark the permalink.